"Billy Dechand has a mind full of ideas, concepts, lyrics and melodies. Not a single song is wasted – no filler, nothing that disappoints. On top of this, he has the kind of voice that is instantly likable; he’s creative, he seems fun, thoughtful, trustworthy, and generally quite interesting. That’s pretty much everything you want from a musical artist." "Overall, this is a very good album that showcases Billy’s musical and emotional range as a songwriter. All sides of life are here, from the poignant to the humorous, from the personal to societal concerns. He has a strong sense of craftsmanship and a gift for consistently memorable melodies and hooks. He has melded his influences into a style very much his own. Highly recommend for fans of left field pop/rock." "a wonderfully personable experience with some excellent songwriting"
"An infusion of David Bowie and Paul McCartney with a soothing voice that brings the music to life effortlessly." 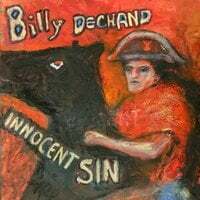 "Singer-songwriter Billy Dechand recorded these sessions in Chapel Hill N.C., and New York City. Given that, he’s difficult to pigeonhole. Dechand’s impish vocals and crunchy, electric guitar licks accelerate various grooves that contain moments of dissonance or sweet melodies. The various musicians coalesce for a sound that sometimes transmits notions of a well-rehearsed garage band, via a diverse track mix. Dechand writes about refuse, love, and other topics via a quirky musical demeanor. He’s an interesting voice amid the sometimes uninteresting East Coast nouveau rock scene." "Every so often, a musician comes along whom you swear that in an alternate reality is already A Big Name and that this reality is impoverished for not knowing him or her. Billy Dechand is such a name, and it's high time that people get with the program." "This is one of those wonderful discs which simply defy classification. On the mellow side, the songs are complex, well written, and well performed. Gentle melodies glide you through this disc, weaving seamlessly from song to song. This is a really great disc. "The group's approach is miles ahead of a large portion of the rubbish on present-day rock radio."